My own love affair with pizza began way back in the early 1970s, long before there were pizza chains, or at least very few. Nothing was more exciting then when my Aunt walked in on a cold and dark Friday evening with several large pizza boxes still warm from Dino’s. Inside were perfectly cut thin squares of gooey cheese and pepperoni with just the perfect ratio of grease to sauce. Dino’s was just one of the many small mom and pop pizzerias in the nation at the time, but in our little town of Suitland, Maryland just outside of Washington, DC, Dinos was legend. The crust was thin, with just the right amount of elasticity on the bottom to fold it if you wanted with a slightly crunchy crust—but only on the outside. 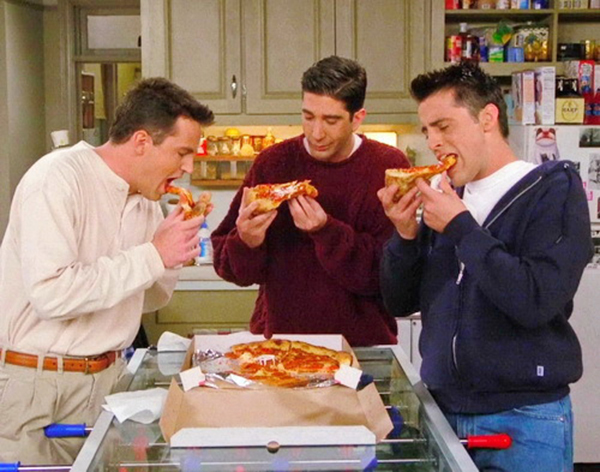 Eating pizza with “friends” is the only way to eat it. Delivery is nice in a pinch, but I’m feeling nostalgic for the pizza experience. Pepperoni pizza is the most popular pizza type in the world. More than 3 billion pizzas are ordered every year in the United States. More than 1 billion frozen pizzas are purchased every year in the United States. The first pizzeria to open in the United States was Gennaro Lombardi in 1895 in New York City. The National Today data science team surveyed 1,000 people about their pizza-eating habits and here’s what they found. The 10 most popular pizza toppings are cheese, pepperoni, sausage, mushrooms, bacon, onions, green peppers, black olives, Canadian bacon, and yes—pineapple. Not only are pizza stats hitting the numbers in the billions, Domino’s says it plans to open nearly 10,000 new stores in the next six years. The only thing missing from the convenience of pizza delivery is the experience of actually going to a pizzeria, specifically one that is dimly lit with kitschy red and white cafe curtains on a Friday night with a date or a group of friends. As young as 13, my friends and I would pool our babysitting or grass-cutting money and walk, actually walk, to Bambino’s, a small family-owned business in a strip mall almost literally outside the gates of Andrews Air Force base, now Joint Base Andrews. At 13, we felt grownup eating on our own without parents, Coca-Colas in hand as we eyed the Air Force men in their uniforms eating pizza with their coworkers on break. In the hey day of big suburban malls, I always skipped the Orange Julius and gravitated to the pizzeria with the Italian flags hanging on the walls and the muscular young Italians behind the counter tossing their dough in the air with skill and showmanship. 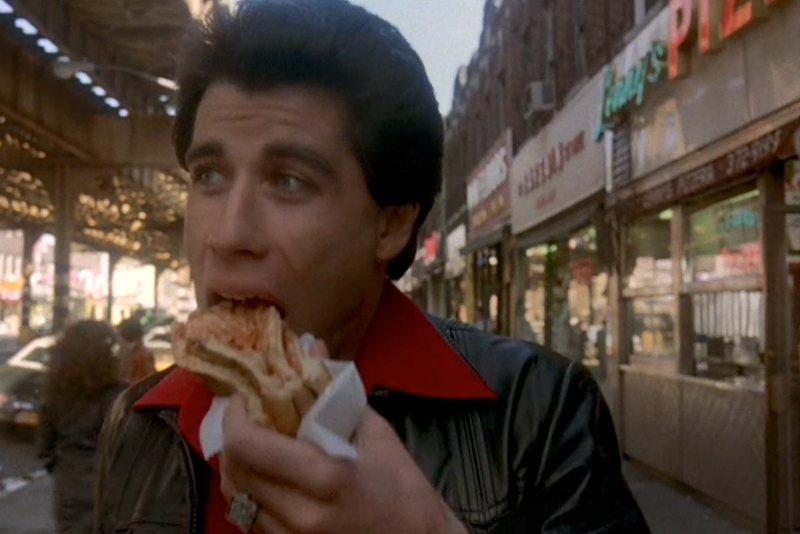 The real money shot of “Saturday Night Fever.” Travolta was without a doubt eating classic New York Pizza. 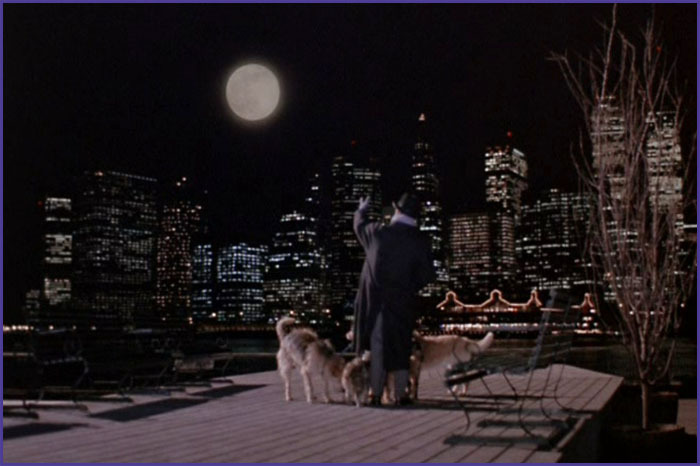 In an earlier frame from the movie, “Tony” is shown holding the large triangle pizza slice before folding it in half. There is no doubt in my mind that people need to turn off their phones while dining out and pay attention to one another. I can only imagine a group of twenty-somethings actually sitting in a pizzeria today, necks bent as they fixate on their phones. Going out with your friends used to mean actually talking to them and enjoying the atmosphere, no matter how kitschy. I worked at Dinos for 11 years. The best pizza ever! Well, sir, you are my hero! It was, indeed, the best pizza I ever ate!